HBO waited just two days after its Sunday night launch of Luck to announce that the mostly critically praised horse race drama will mount up for a Season 2. "We are very excited about where David and Michael plan to take these incredible characters," HBO programming president Michael Lombardo said Tuesday, referring to co-executive producers David Milch (Deadwood) and Michael Mann (Miami Vice). 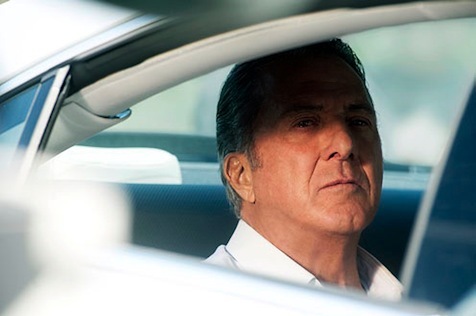 Luck's stars include Oscar winner Dustin Hoffman and three-time Oscar nominee Nick Nolte. Season 1 will run for 10 episodes, with filming on a 10-episode Season 2 scheduled to start at the end of February, HBO says. ***Fox's The X Factor will begin its second season next fall without host Steve Jones and judges Paul Abdul and Nicole Scherzinger. All have been sacked, according to various reports. The mega-hyped singing competition gave Fox's usual moribund fall ratings a significant boost, but didn't approach the 20 million viewers predicted by executive producer/judge Simon Cowell, who isn't about to fire himself. Instead X Factor averaged 12.5 million viewers per episode. ***PBS' hit series Downton Abbey will add Shirley MacLaine to the cast for Season 3. She'll play a new character named Martha Levinson, mother of Lady Grantham (Elizabeth McGovern), the network says. "Shirley MacLaine is a great actress and she's as American as the day is long," Masterpiece executive producer Rebecca Eaton enthused in a publicity release. "I can't wait to see her go toe-to-to-toe with Maggie Smith's Lady Violet." Downton Abbey, currently in its second season and airing under the Masterpiece banner, is the reigning Emmy winner in the made-for-TV movie/miniseries category. ***CBS and the Academy of Country Music have a new deal that will make them broadcasting partners all the way through 2021. It means the network will keep reaping ratings gold from ACM's annual prime-time awards ceremony, which will air this year on April Fool's night with Blake Shelton and Reba McEntire repeating as hosts. ***Spike TV continues to stand tall as the knuckle-dragging network for men. Its three new announced series include Rat Bastards, in which Louisiana-bred "Cajun Commandoes" hunt 40-pound swamp rats for selling and eating purposes. Spike's other newcomers are "Tattoo Nightmares and Full Bounty, which features a dozen apprentice bounty hunters trying their hands at corralling dangerous fugitives. ***On an infinitely higher plane, CBS' eighth Jesse Stone mystery movie, Benefit of the Doubt, will air on Sunday, May 20th. Tom Selleck returns in the title role.